This book came into my reader’s world at the perfect time. I’ve just started learning more about essential oils and aromatherapy, realizing that I have an interest in natural ways to clean, play, and live. 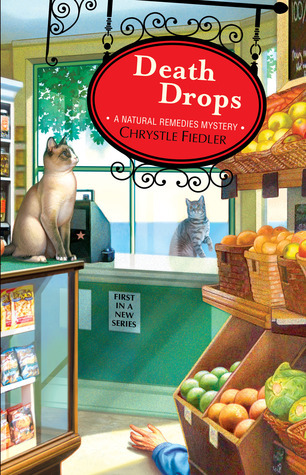 And then I read Death Drops, the first in Chrystle Fiedler’s Natural Remedies mystery series, and my interest kicks into overdrive! Main character and narrator Willow McQuade comes across a devastating scene at her aunt’s shop and cafe. To many, Willow’s aunt’s death is nothing more than a sad accident. But Willow knows something is very wrong with the whole scenario – and she is determined to uncover the truth, no matter what the cost. As Willow digs in to the mystery, life becomes more and more dangerous, from slashed tires and break-ins to veiled threats and outright attempts on her life. Willow surrounds herself with old friends and new – even sparking a bit of romance with a former cop who needs Willow’s help as much as she needs his. One of my favorite things about Death Drops is how the author weaves in tips and suggestions for natural remedies throughout the story. I dog-eared pages with particularly interesting tips for easy reference later. The story moves at a quick pace, but readers can easily keep up with the clues Chrystle Fiedler leaves. Death Drops is fun, engaging, and interesting – I’m eager to continue the series and continue learning about natural living . . . and maybe even pick up some tips about cutting sugar down! This sounds like a great book. I am new to the essential oils and love natural remedies.